In India, MSD is as famous an abbreviation as RBI or LIC. There will come a time when Mahendra Singh Dhoni will no longer be playing the game, and when that time comes he will go down in Indian cricket history as one of the true legends of the game, a global legend. When Dhoni took over as captain, his greatest gift to Indian cricket was to help it get rid of its anxiety. In the 1990s, when I was part of the team, there were many matches we let slip because we were too anxious in crunch situations. Even under Sourav Ganguly there were traces of this weakness—India bowling first on an obvious ‘bat first’ pitch in the finals of the 2003 World Cup against Australia was symptomatic of this. Chasing scores under pressure prevented India from becoming real champions. Remember all those matches versus Pakistan in Sharjah? By the time Dhoni finished as captain, Virat Kohli inherited an Indian team that are master chasers with Virat himself leading the way in this regard. It was just incredible to see Dhoni, a small-town boy, lead an Indian team that had the likes of Sachin Tendulkar, Rahul Dravid and Anil Kumble. They were not only greats, but also big city boys. Dhoni, interestingly, had no small town traits. Just to compete and measure up to the big city boys (a trap so easy to fall into) he never went over the top with the authority that he had as captain. He never disrespected the greats, nor did you ever wonder who was in charge out there on the field. It was Dhoni. If the 1983 World Cup win was momentous in the history of Indian cricket, a David beating the Goliath of world cricket (the West Indies), the 2011 World Cup win, in my view, was a greater accomplishment. The win in 1983 was freakish. The same West Indian team toured India a few months later and beat us 6-0. The 2011 World Cup was about an Indian team performing with the burden of immense expectation. India was expected to win the World Cup at home. If not for Dhoni’s calmness, India would not have won the 2011 World Cup. It is 2019 and Dhoni is still around, but he is not leading an Indian fight this time. That is now Kohli’s thing. Dhoni is fighting his own fight, to stay relevant, and more importantly, useful to this team. He still runs quickly between wickets, but his powers as a batsman have clearly diminished, and he knows it. The great mind of his has recognised that he has to now rely on his partner, one who can hit the ball out of the ground at will, to keep up with the required run rate. But the warrior in him still wants to be out there on the front lines, trying to win the game for his team; his weapons are a bit rusty, but the will is as strong as ever. 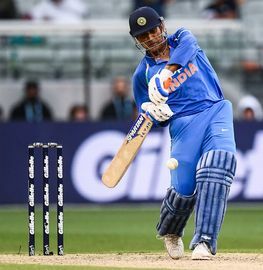 Dhoni knows only one way of winning matches in a run chase—to stay till the very end, almost until the last ball of the innings, even when it is possible to win the match earlier. This approach of his is highly debated. But, this is Dhoni’s way. It is risky, especially given his current ability. Dhoni fans believe in him and think he can still win matches for India like he did in 2011. As for me, his methods worry me, and as a huge Dhoni admirer I pray they do not backfire on him on any big night in the 2019 World Cup.